Woodchucks, marmots, amigurumi ... oh my! It doesn't have to be Groundhog Day to enjoy making a little crochet groundhog. By the way, I recently learned that the groundhog and the woodchuck are the same animal! I didn't know this but it immediately made me think of that great rhyme about how much the woodchuck chucks! Whatever you might call them, these ten crochet patterns for amigurumi groundhogs and groundhog crochet appliqués are all that you need to go to groundhog heaven! Sarah Zimmerman of Repeat Crafter Me always has adorable crochet patterns for kids and babies. 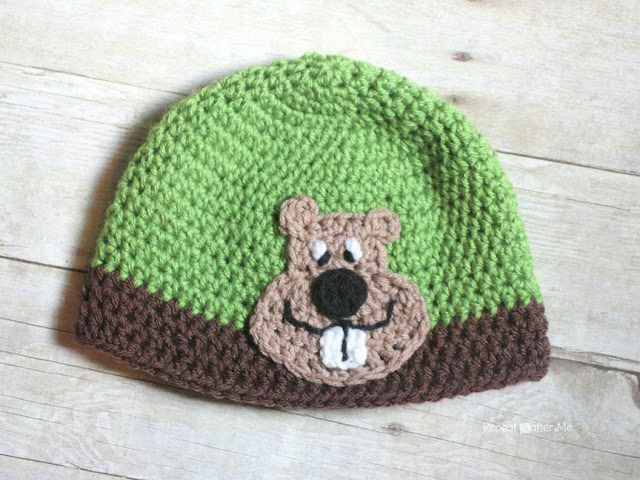 In this example, she has created a cute cartoon-like crochet groundhog appliqué that you can add to a hat (as shown) or to a blanket or any other item that you want to dress up with a bit of cuteness. Planet June is one of the best sources for purchasing adorable animal amigurumi crochet patterns that do a great job of representing what the actual live animal looks like. Her amigurumi groundhog crochet pattern is no exception to this awesomeness. Stacey Trock of FreshStitches does fabulous work creating crochet stuffed animals that have an adorable sense of character. She sells the crochet pattern for this stuffed animal groundhog. "Marmots, groundhogs or woodchucks don’t have the right body shape to give them the doll shape most of my crochet animal patterns have. Their body is more suitable for a standing type of amigurumi." Mad Crochet Lab has created a cute little crochet groundhog here that has those big woodchuck teeth! And it's not just any old groundhog; it's a finger puppet! This is a fun free animal crochet pattern. Back in 2014, Tea, Love Crochet shared the first ever pattern designed for the blog. It just so happens that it was a groundhog crochet pattern! It's a cute little crochet pattern featuring the body, muzzle, arms, tail, and teeth. Embroidery stitches add super bold eyebrows that give character to the face of Groundhog Gary! More embroidery provides details on the paws. This is a perfect amigurumi crochet groundhog pattern for anyone who wants to pay attention to the little things with they craft. This crochet pattern is for sale on Ravelry. Want to make a tiny crochet groundhog? This free crochet pattern from Genuine Mudpie is about 3" tall when finished. This free groundhog crochet pattern is designed to be made in #10 size cotton thread. It's available as a free dowload on Ravelry from Cecinatrix. See some tips for thread crochet. This little version of the groundhog is designed as a crochet coaster. However, it could also be used as an appliqué. Or you could make a bunch of them and string them together into bunting for a child's room. This crochet groundhog pattern is a free download on Ravelry.